We offer state of the art SF6 gas filled Standard Capacitors, Measuring Capacitors & Coupling Capacitors to our clients. Our Standard Capacitors are suitable for integration with capacitance and Tan Delta Bridge for accuracies in the range of 10-5. The offered Standard Capacitor is customized and available at very reasonable price. Furthermore, the Standard Capacitor provided by us is known for its high performance and durability. In addition we make oil filled measuring & coupling capacitors for HVAC & Partial Discharge measurements in the range of 60kV to 800kV (100pF to 1000pF)other capacitance ratings also available as per customer requirements. As a Standard Capacitor (Reference) for Tan delta measurements. The capacitor is manufactured with state of the art technology reliable, rugged and maintenance free. 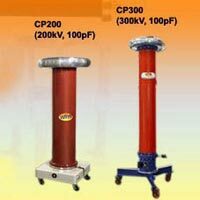 Coupling & Measuring Capacitors : 60kV to 800kV in 100pF & 1000pF models. 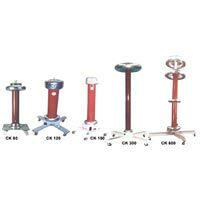 Other capacitance ratings can be designed & supplied as per customer requirement.